This bone saw is lightweight and easy to use. The extra fine cutting edge makes smooth cuts. Very practical for clinical grossing stations and research labs. Handle near blade provides good control and balance. Powerful 17,000 rpm motor oscillates at 32,000 oscillations per minute to cut bone and not tissue. Easy to handle, and cuts quickly to minimize operator fatigue. Power switch toggles on and off. 10-foot cord with hospital-grade plug provides maximum flexibility. Fixed arbor large section blade is included with the saw. Saw attaches to the HEPA Bone Dust Collector (optional). One fixed arbor 2-1/2" section blade and 0.125" allen wrench, are included. The optional HEPA Bone Dust Collector is 99.9% effective in trapping particles as small as 0.3µm with a HEPA filter. This filtering reduces the chance of contact with fine dust and waste material. 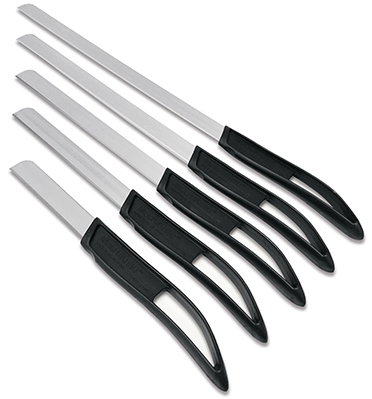 Includes an attachment device for the Autopsy Saw, product numbers 54474 and 54474-230. 54474 Autopsy Saw, 110-120V, 60Hz each P.O.R. The Ideal Micro-Drill™ is designed for research applications that require round and inverted cone surgical burrs. The drill is constructed of light-weight aluminum alloy for balance and control and is powered by a rechargeable 6-volt nickel cadmium battery. Under normal conditions the unit will function for 8 hours between recharging. 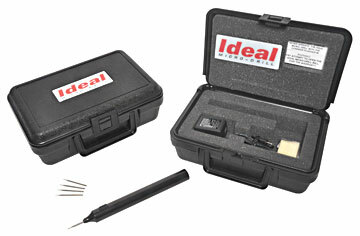 The Ideal Micro-Drill™ comes with a set of 5 round burrs. The set includes sizes 0.6mm, 0.8mm, 1mm, 1.2mm and 1.6mm. Additional burr sizes are also available, see below for ordering information.